We have a number of products for your Samurai. If you don't see what you are looking for give us a call as we have access to many factory replacement parts...too many to list here! 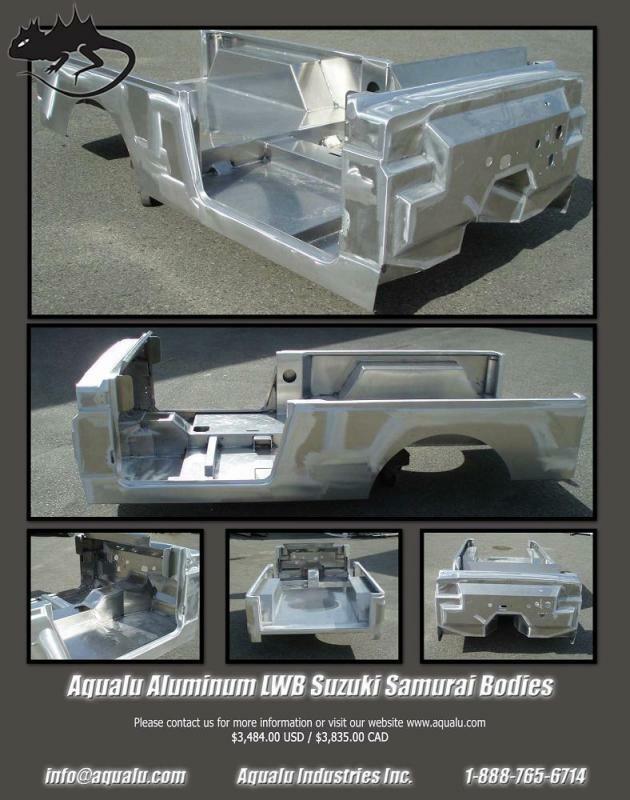 Brought to you from Aqualu Industries Inc., an all aluminum Samurai LWB body. Modifying a vehicle for off-road use, whether it is centre of gravity, suspension or steering, will change the way it handles both on and off road. Reaction, ride and possible premature wear on parts are possible. Extreme caution is recommended when encountering off camber of abrupt manoeuvres. Avoid sharp turns that may result in a vehicle’s loss of control and/or possible roll-over causing serious injury or death. Height modifications may increase a vehicles susceptibility to roll-overs. Know your provincial, territory, or state lift/modification laws. Not all modifications may be legal for road or safety certification in your area. 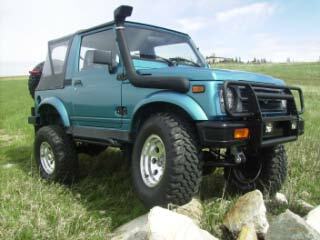 Knowing your provincial, territory, or state laws is the responsibility of the purchaser and/or vehicle operator.All Zuki Nation kits and products are designed and produced for off road use only. All liability pertaining to the installation and usage of all Zuki Nation products is the responsibility of the vehicle owner and at his/her own risk. Zuki Nation recommends a professional mechanic install all kits and have your vehicle inspected regularly.Zuki Nation products are covered by a Replacement Warranty only. Warranty items are subject to inspection before warranty replacement. Material and Workmanship Warranty for a period of six months from purchase date. No refunds after purchase. By the purchase of any parts, kits, and/or vehicles (modified or not) the purchaser is fully aware that he/she is completely responsible and releases any liability to Zuki Nation and/or any of it’s affiliates, agents, or representatives and Zuki Nation and/or its affiliates cannot be held liable for any accidents or injuries causing bodily harm and or death.